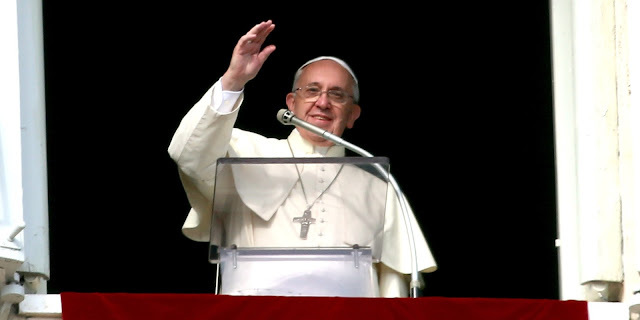 English translation of Pope Francis' remarks at the Angelus of 24 December 2017. VaticanNews Release: Angelus Dear brothers and sisters, n this Sunday that immediately precedes Christmas, we hear the Gospel of the Annunciation (cfr. Lk 1,26-38). In this Gospel passage, we can note a contrast between the promises of the Angel and the response of Mary. Such a contrast is manifested in the dimension and in the content of the two protagonists. The Angel says to Mary: “Do not be afraid, Mary, for you have found favor with God. Behold, you will conceive in your womb and bear a Son, and you shall name Him Jesus. He will be great and will be called Son of the Most High, and the Lord God will give Him the throne of David His father, and He will rule over the house of Jacob forever, and of His kingdom there will be no end” (vv. 30-33). It is a long revelation, which opens unheard prospectives. The Child that will be born of this humble girl from Nazareth will be called the Son of the Most High: it is not possible to conceive a higher dignity than this. And after Mary’s question, with which she requests explanations, the revelation of the Angel becomes even more detailed and surprising. On the other hand, the response of Mary is a short phrase, that does not speak of glory or of privilege, but only of availability and of service: “Behold the handmaid of the Lord: be it done unto me according to your word” (v. 38). Even the content is different. Mary is not exalted in the face of the prospective of becoming even the mother of the Messiah, but remains modest and expresses her adherence to the project of the Lord. This contrast is significant. It makes us understand that Mary is truly humble and doesn’t seek to show off. She recognizes that she is small in the presence of God, and is content to be so. At the same time, she is aware that the realization of God’s project depends upon her response, and so she is called to adhere to it with her whole being. In these circumstances, Mary is shown to have an attitude that corresponds perfectly to that of the Son of God when He comes into the world: He wills to become the Servant of the Lord, placing Himself at the service of humanity to fulfil the project of the Father. Mary says, “Behold the handmaid of the Lord”; and the Son of God, entering into the world, says, “Behold, I come […] to do your will, O God” (Heb 10,7.9). The attitude of Mary fully reflects this declaration of the Son of God, who becomes Mary’s Son as well. So the Madonna is revealed as the perfect collaborator of God’s project; and in the Magnificat is able to proclaim that “God has lifted up the humble” (Lk 1,52), because with this, her humble and generous response, she has received a most high glory. While we admire our Mother for her response to the call and mission of God, let us ask her to help each of us to welcome the project of God in our life with sincere humility and courageous generosity. As we prayerfully await the birth of the Prince of Peace, let us invoke the gift of peace for the world, especially for those peoples who are suffering because of ongoing conflict. As we celebrate Holy Christmas, I especially renew my appeal so that persons who have been abducted – priests, religious men and women and lay persons – be released so they may return to their homes. I wish to assure my prayers to the population of Mindanao Island in the Philippines, which has been struck by a storm that has caused numerous victims and much destruction. May the merciful Lord receive the souls of the dead and comfort those who are suffering for this disaster. With affection, I greet all of you, believers from Rome and pilgrims from various nations, families, parish groups and associations. In these hours that lead us to Christmas, I invite you to find a few moments to stop in silence and prayer before the crib, in order to truly worship the mystery of Christmas: that of Jesus who is coming to us with love, humility and tenderness. In those moments remember also to pray for me. Thank you! Have a good Sunday and a Happy Christmas!